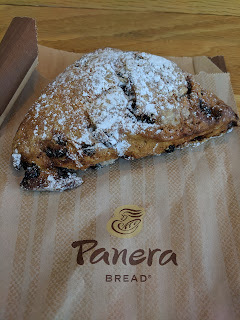 I was pretty excited to see most of the changes Panera made to their pastry lineup this year, mostly removing sooo many items I always found lackluster, and adding a few that look much better. But ... they also touched the scone section. They did away with the mixed berry (meh, whatevs, it was fine), they revamped the cinnamon crunch (great, I never liked that one anyway). They also changed my precious blueberry scone. 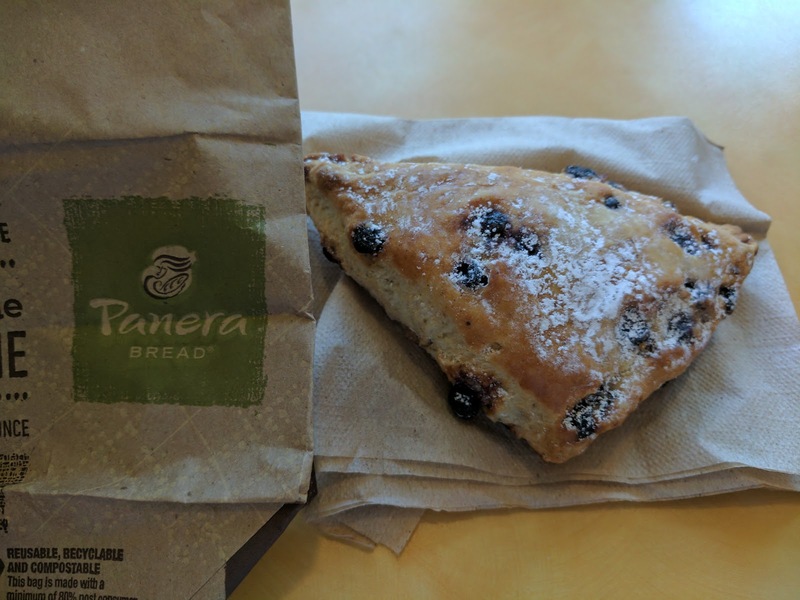 Gone is the triangle shaped "wild blueberry" scone, and in its place is a round simple "blueberry" version. I was nervous. I loved that old version. The Panera FAQ page even has a section devoted to it. I clearly wasn't the only one concerned. "It's true - we've said goodbye to the Wild Blueberry Scone on our menu and have replaced it with our new Blueberry Scone. It is now a cream-based scone made with fresh blueberries. If you liked it before, you'll love it now!" It turns out, they changed very little. Blueberry Scone (December 2018). $2.99. "A freshly baked, cream-based scone overfilled with plump, fresh blueberries." The description now reads one word different: "fresh blueberries" instead of "wild blueberries". Besides the type of berries used, I think they really did keep the same recipe. The scone is still more like a biscuit to me, a shortcake biscuit, and now it is appropriately shaped to be a biscuit. It has a touch of tang. A good crumb. Moist inside, crisp outside. Exactly as before. And now ... loaded with bigger, juicier full size blueberries, not little wild berries. This is even better. Remember my original review? I said ... "They are tiny wild blueberries though, not big, bursting with flavor berries, which I'd prefer." Well, thank you Panera. It turns out, you took my favorite item, and improved it. Kudos. I'll gladly get this again and again. I've now tried every variety of Panera's scones. My conclusion? The awesome sounding (and looking!) cinnamon crunch always disappoints, the orange one is always strangely *almost* something I want, and the the Triple Berry is similar enough to the Wild Blueberry that it will do in a pinch. But the wild blueberry scone remains my sole "go to" item at Panera, (but never for a breakfast treat, rather, to bring home and shortcake it!). Triple Berry Scone. $2.99. (August 2018). "Freshly baked, cream-based scone made with dried strawberries and blueberries and raspberry flavored chips, then finished with a light glaze of white icing and half & half cream." 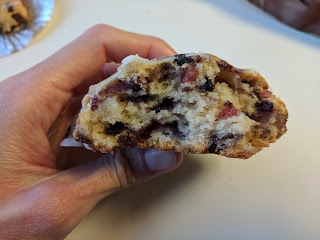 Since the wild blueberry one has been such a hit, I finally decided to try the triple berry, a very similar sounding scone, same cream base, just with dried strawberries and blueberries (and raspberry chips?) rather than what I think are just dried blueberries (although maybe they use fresh for the blueberry scone? ), and, the addition of a glaze on top (bonus!). I was pretty disappointed when I picked up my scone. Had I ordered it in person rather than mobile, I likely would have asked for a different one, although the entire pan looked like this. It was really over-baked, dry, and burnt around the edges and on bottom. The cinnamon scones in the next baking rack looked like they had been decorated by a 4 year old in the kitchen, with glaze all over the place. I think the baker was ... struggling this day. I still tried it, but, as I could tell just from looking at it, it was really dry, and the burnt edges and bottom tasted horrible. I salvaged it the best I could, and could tell that I did like the flavor of the base, very much the same as the blueberry, but it was also obvious that the little dried fruits inside were hard style, and not really what I like. Eh. The icing was nice of course. Overall, this was fine, and if cooked properly would be my second choice of scone at Panera, but the blueberry is just far superior. It was clearly different from the wild blueberry in other ways, coming in at only 390 calories vs 460 in the blueberry, which was a bit surprising. I'm really not sure what is different about them, but it is higher sugar and lower protein as well? Triple Berry Scone. $2.99. (September 2018). I decided to give the Triple Berry another try, when I saw it was properly baked. It was nicely cooked this time, no burnt edges, consistently baked. Well coated with sweet glaze. I liked the glaze, wished the blueberry one had the glaze. The base seems less sweet than the blueberry version, which I never really consider "breakfast", but rather, more like a biscuit to have with fruit and whipped cream as shortcake. This one could standalone as a breakfast scone. That said, the base wasn't particularly interesting, no real tang. Decent crumb in that it wasn't hard or too soft, but also, not great, like most of Panera scones, more on the cake-like side of things. Here you can see the insides of the scone, generously loaded with dried blueberries, little tiny dried blueberries, and bits of red. The red bits I guess were the raspberry "chips" and the "dried strawberries", but I didn't really find what I'd identify as dried strawberries. That said, the fruity bits were all enjoyable enough, lots of pops of flavor, bits of chewy texture, and I enjoyed it. My second favorite scone, and if the blueberry is ever run out, its worth getting, but, the blueberry is still my first pick. I've had this one many times. 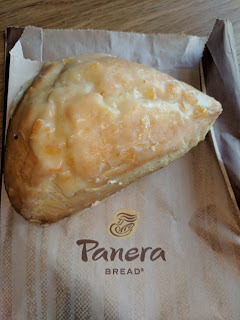 It truly is my favorite of Panera's scones, really something I enjoy, although, as always, fairly sweet for breakfast. To me, this is dessert, if you warm it and top with whipped cream or ice cream. Even better if you add macerated fruit for a shortcake. This one however was a bit over baked as well. Not sure what is going on with my local Panera! Another year, more Panera scones. This time, I stuck with wild blueberry on most visits, and didn't bother write reviews, as I've covered them before. But I did try a new flavor: orange. "Freshly baked scone made with flour, butter, brown sugar and orange peel and topped with orange icing." After exhausting all other scone choices, I finally gave in to try the orange scone. Sometimes I can be surprised by liking something unexpected, after all. I took one bite, and the taste was very familiar. Fruit Loops. It tasted like fruit loops. Besides that though, it was just a Panera scone, a bit dried out on the edges, very cakey inside, with lots of sweet icing on top. I didn't care for it, but the Fruit Loop flavor was uncanny. Orange Scone. $2.99 (July 2017). A few months later, I tried another. I had ordered a cinnamon crunch bagel through Rapid Pickup, and ... they were out when I arrived. I was offered a pastry instead, and the offerings were limited. So, another orange scone it was. And, it was exactly as I remembered. It was soft and cakey. The glaze tasted exactly like Fruit Loops. It was not bad, but it was not very good either. I don't see a reason to get another at this point. Another year, more Panera scones. I still like the wild blueberry. You can start with my earlier reviews for more context. 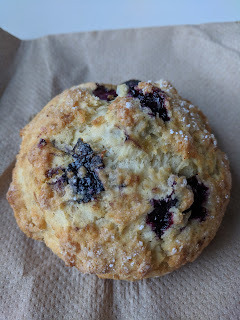 This year, I played it safe, and got the some scone as I did last year: Wild Blueberry. 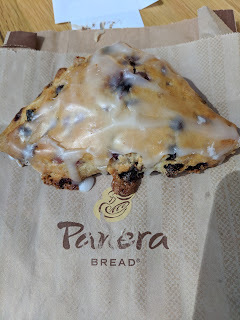 I actually went to Panera intending to try the Triple Berry scone, with its dried strawberries and raspberry chips in addition to blueberries, plus an icing glaze, but, alas, it was discontinued, so, the single berry, no glaze option was all I had. It was pretty much exactly what I remembered. More like a shortcake biscuit than a breakfast scone, kinda sweet, a tiny bit of tang. It crumbled nicely, like a bread or cake, not making a mess. The little wild blueberries were good, but, I really wished they were bigger. Overall, it was again good, for a shortcake biscuit, but not quite right for breakfast. I'd get it again if I was in the mood for this kind of item. 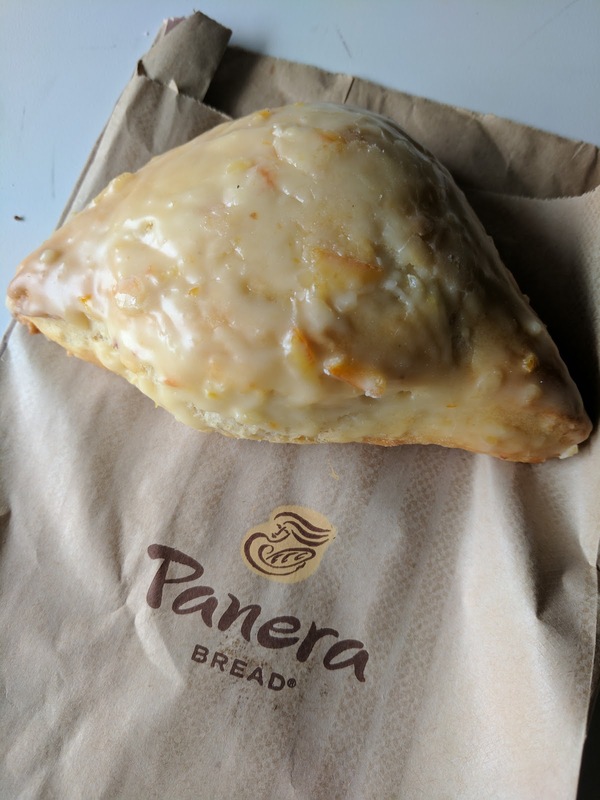 If you didn't read my original Panera scones review, I suggest you start there, and then return to this update, since I'm skipping the background this time around. See "Original Review, September 2014" below. 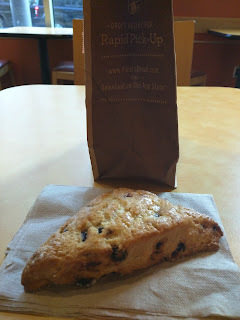 The short version: I've never loved their scones, but finally found one that is decent enough. "Freshly baked, cream-based scone overfilled with plump, wild blueberries." This is a hard-style scone, but somewhat cakey, more like a shortcake biscuit. It had a decent tang to it, not as much as I wanted, but at least there was some flavor in the base. Studded with little blueberries, which provided decent pops of flavor. They are tiny wild blueberries though, not big, bursting with flavor berries, which I'd prefer. It isn't quite what I want in a breakfast scone, but actually would be quite good with whipped cream and some fruit, turned into a shortcake. Or perhaps just with clotted cream and jam, for tea time? But on its own, it falls a bit short. Panera likely isn't novel to you. As a chain, their stores exist all over the country. I've reviewed them before, for their drinks (not bad! ), bagels (I love their cream cheese! ), and muffins (not good) . I'm skipping all the generic details in this review, and only commenting on the specifics of their scones. Because, even though I didn't like the muffins, I love my baked goods! Strawberries & Cream Scone. $2.49. "Freshly baked, cream-based scone made with dried infused strawberries and white chocolate chips." After failing to be impressed with the muffins at Panera, I decided to try my luck with a scone instead. They had several varieties, but the strawberry & cream caught my eye. The description didn't really seem accurate. I didn't find any white chocolate chips in it, anywhere. Nor any consistency changes that it could have been a melted chip. I'm very puzzled by the description. The strawberries also didn't seem dried. They came as decently sized, moist, chunks. They were quite flavorful and good. The scone base was crumbly but moist. It was clearly cream based. Pretty good flavor. On top was a lot of glaze. It didn't seem to have any particular flavor other than sweet. Perhaps lemon? Overall, this was a very sweet product. I would have liked a black coffee with it, rather than the tea I was drinking. I thought tea was the right pairing for a scone, but in this case, it was just too sweet and needed something bitter to balance it. Not a mind blowing scone, but it was enjoyable. Not sure if I'd get one again, but it wasn't bad. A decent price for an insanely large scone. "Freshly baked, soft and tender cream-based scone flavored with cinnamon chips and finished with a cinnamon crunch and white icing glaze." The next time I wound up at Panera, I decided to try another scone, since the previous scone had been far better than the muffins I'd tried, and I wanted a sweet, bready breakfast item. This time, a new seasonal option jumped out, the cinnamon crunch scone. It sounded like a cross between a scone and a cinnamon roll. I've been on a cinnamon roll kick lately, so it sounded intriguing. 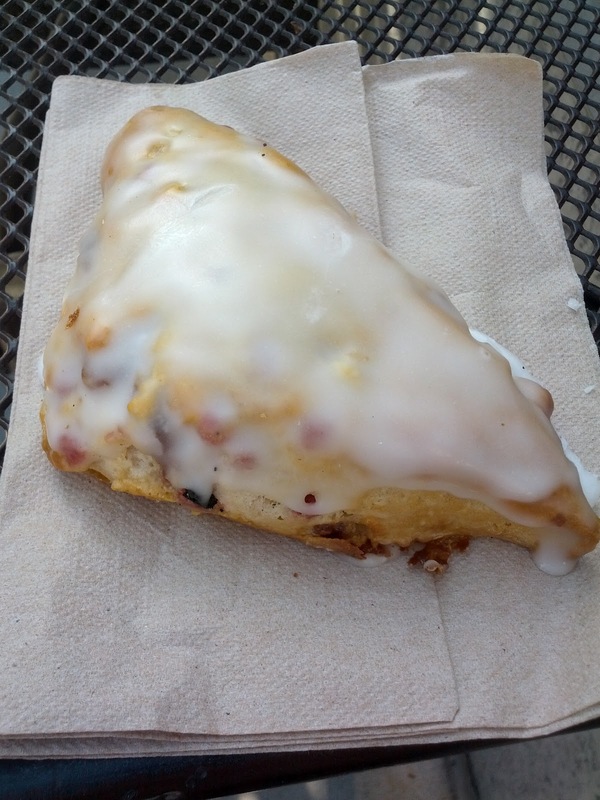 Unfortunately, the scone sounded much better than it actually was. The texture was right, with a good crumbliness to it, not dried out. But the base didn't really have much flavor. I always love a bit of a tang to my scone. There were plenty of little tiny cinnamon chips throughout, which I thought would give it a ton of flavor, but really didn't. The cinnamon aroma was stronger than the taste. On top was an unremarkable sweet glaze. I appreciated that part, as I was really in the mood for sweet. I also really wanted it warmed up, and wish Panera offered their goods that way (besides just using the microwave). Warm muffins, scones, etc are always just soo much better! I brought home the part I didn't finish and heated it up in the toaster oven, and indeed it was better that way. Overall, it was quite unremarkable. No bad, but not good. I wouldn't get another. Perhaps my problem is that I went into it wanting it to be more like a cinnamon roll, I wanted more cinnamon flavor, more icing, more ... something. (Panera does make a cinnamon roll, but it really didn't look great). Like most of Panera's food, the nutrition stats shock me. Yes, it was a large scone, but 550 calories? 23g fat? And, I guess due to the glaze, 41g sugar? Wow. I don't care that much about nutrition stats these days, and only noticed it because the signs in Panera all prominently display these details, but certainly not worth it. The price of $2.49 however was fine for a huge scone. "Freshly baked, cream-based scone with dried cinnamon apples and caramel chips, topped with a thumbprint of apple filling and caramel icing." And finally, another visit to Panera, another scone. As I stared at the rows of pastries, a helpful employee came bouncing up. "Do you like apple pie? ", she asked. Now, this is a hard question. In the realm of pies, apple is pretty low on my list. But, a nice, flaky double crust apple pie, served hot, with melted cheese (don't ask, its a New England thing) and a scoop of ice cream can be pretty good. But a generic apple pie? Meh. Although, still a pie. With all these thoughts running through my head, I simply said "Sure?" 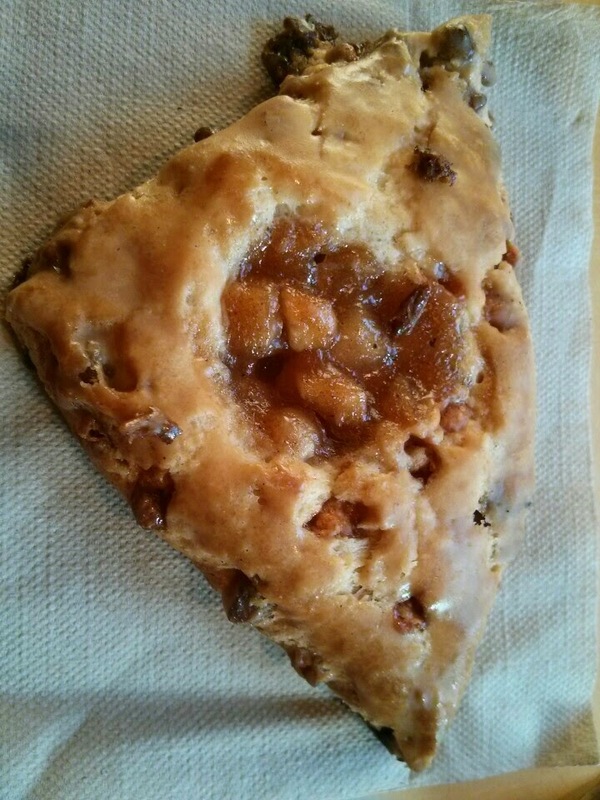 And she eagerly went on to tell me all about the latest seasonal offering, the caramel apple scone. She said it was the absolute best item they had, and, just like an apple pie. Since I was being indecisive anyway, I went for it. The scone base had a slight tang to it, but it was minimal. There was a slight taste of cinnamon, but again, minimal. It seemed dry and almost stale. The bottom was a bit burnt. So far, not much of a foundation to build on. 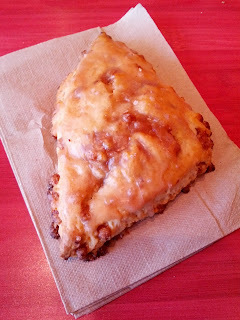 Throughout the scone were little bits of caramelized apple. They were chewy and sweet, which was kinda nice. I never discovered the promised caramel chips, which reminded me of the strawberry and cream scone, where I never found any promised white chocolate chips. On top was a sweet glaze, not particularly interesting, but, it was sweet, and did give a bit of flavor. I guess this was the "caramel icing". In the center was apple filling, the part that was supposed to make it amazing, and, "exactly like an apple pie". The filling was awful. It was just goo. Mushy little bits of apple, in a very, very thick goo. A spiced goo, but the spicing, particularly the nutmeg, was just too strong. Also, why on earth did the scone have a bunch of goo in it? Doesn't this sort of filling belong in a danish, not a scone? It was worse warmed up. Yes, it was more moist and not dried out at least. And yes, it was more like a pie I guess. But the icing just melted away. And the almost-pleasant chewy bits were now soft. I certainly preferred it at room temperature. Warm like this, it reminded me of airplane food. 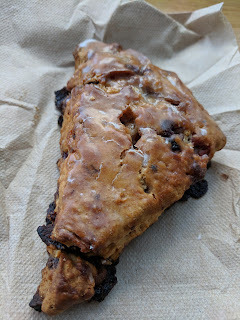 It wasn't the worst scone I've ever encountered, but it certainly wasn't good, not a good way to spend 450 calories, or $2.49, and I won't be getting another.